Official Nominations: The Great Gatsby. Chinatown. Daisy Miller. The Godfather Part II. Murder On The Orient Express. 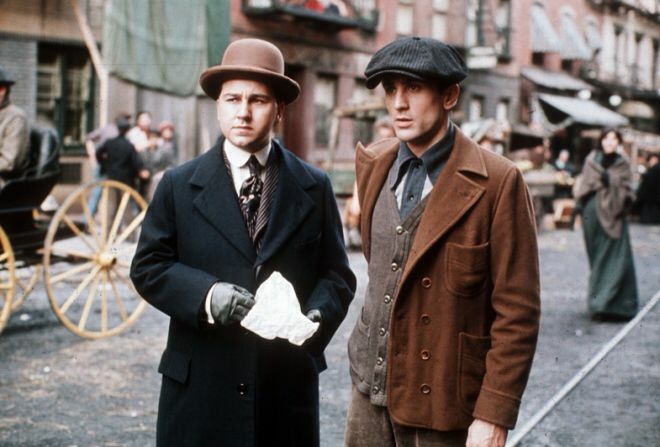 It wasn’t my intention to have The Godfather Part II win everything, but when you compare it to everything else here, remembering it features styles from at least two entirely different eras spread between US and Sicily, it’s the clear winner. The Great Gatsby got the official win, as period pieces generally do, and while it is authentic it’s at least an equal to Daisy Miller. Chinatown and Murder On The Orient Express are on fairly level footing too. My Nominations: The Great Gatsby. Chinatown. Daisy Miller. The Godfather Part II. Murder On The Orient Express. Blazing Saddles. The Golden Voyage Of Sinbad. Zardoz. All the regulars make it over, and I add a few more period pieces. Zardoz…. has to be seen to be believed, and if you see Sean Connery’s costume you know all you need to know. About anything. Blazing Saddles speaks for itself, while The Golden Voyage Of Sinbad earns my alternative pick thanks to plenty of fine detail fleshing out many of its exuberant characters. Let us know in the comments which film you pick as winner! Official Nominations: Travels With My Aunt. The Godfather. Lady Sings The Blues. The Poseidon Adventure. Young Winston. It’s a weird one. In a year that Cabaret gets nominated for almost everything, it fails to get nominated for one of the most obvious categories. All the stranger is the fact that Lady Sings The Blues is nominated over it. The Academy seemed determined to make sure Travels With My Aunt won something, so here we are. The Poseidon Adventure gets a nomination for sheer scope and detail and Young Winston gets a period piece nod too. None of the films here stand out for any obvious reason, so when in doubt go with The Godfather. My Nominations: The Godfather. Cabaret. Poseidon Adventure. There isn’t really anything additional this year that I would want to add, aside from Cabaret. Let us know in the comments which film you choose to win Best Costume Design! Official Nominations: Nicholas And Alexandra. Bedknobs And Broomsticks. Death In Venice. Mary, Queen Of Scots. What’s The Matter With Helen. Two obvious picks with two big costume dramas – three other normals. Take your pick between Yvonne Blake and Antonio Castillo’s Nicholas And Alexandra and Margaret Furse’s Mary, Queen Of Scots. My Nominations: Nicholas And Alexandra. Mary, Queen Of Scots. A Clockwork Orange. McCabe And Mrs Miller. Red Sun. Willy Wonka & The Chocolate Factory. Along with the costume dramas I add three should-have-beens, and one never-would-have-been. A Clockwork Orange may not at first glance seem as visually arresting as some of Kubrick’s other work, but the attention to detail in costume and set design is paramount. A Clockwork Orange wouldn’t be see unnerving without the pale, iconic, almost jumpsuit look of Alex and his droogs often as a counterpoint to the more stylized 70s flair of everyone else. McCabe And Mrs Miller is of course a gorgeous movie with the costumes a huge part of the overall tone, while the characters in Willy Wonka And The Chocolate Factory appear as extensions of their clothing – from the drab look of Charlie and his grandfather to the exuberant red festive attire of Veruca, not to mention Wonka and the Oompa Loompas. Finally, lets add Red Sun as it doesn’t get mentioned enough. Let us know your winner in the comments below! Official Nominations : Cromwell. Airport. Darling Lili. The Hawaiians. Scrooge. Cromwell is a worthy winner, though on a personal note this era and style does little for me from any sort of aesthetic viewpoint. Airport gets a nod for the sheer scope and diversity on offer, Scrooge is much the same as Cromwell though a couple of centuries later. The Hawaiians and Darling Lili don’t really need to be here – both are fine but nothing out of the ordinary. My Nominations: Cromwell. Tora Tora Tora. MASH. Brewster McCloud. Catch-22. The Conformist. If I add one war movie, then I have to add them all – my three picks here all being of a similar quality. The Conformist gets another nomination, because of course it does, while Brewster McCloud is hilarious. It deserves a nomination for those wings alone. Well, that’s about the only ‘costume’ costume in the whole things, but anyway…. Which film of 1970 do you pick as the winner for Best Costume Design – let us know in the comments! Official Nominations: Anne Of The Thousand Days. Hello Dolly. Gaily Gaily. Sweet Charity. They Shoot Horses Don’t They. Costumes. What can you say? They all look swell. My Nominations: Anne Of The Thousand Days. Hello Dolly. Sweet Charity. The Damned. Not a lot more I can do with this one, so I’m throwing on The Damned as well. What film of 1969 do you pick as the Best Costume Design winner? Let us know in the comments! No surprises this year, as is standard for this category, with musicals and historic and costume dramas leading the year. Perhaps Morton Haack’s work on Planet Of The Apes is a surprise given the type of film, but it is a deserving nomination. Two time winner Danilo Donati’s Romeo And Juliet is the ‘weak link’ here, while Star! is a little too generic in its extravagance. Oliver! is a good choice for winner, the costumes as important as the music, setting, and performances. My pick though is for The Lion In Winter with Margaret Furse and Lee Poll – it’s all very brown and drab and selected to make England look barren and frigid, but with a flawless eye for detail. My Nominations: 2001: A Space Odyssey. Barbarella. Chitty Chitty Bang Bang. Once Upon A Time In The West. The Lion In Winter. Planet Of The Apes. Only two make it over to my list, joining Once Upon A Time In The West – another movie highlighting the skill of Carlo Simi. My other selections are more iconic, with 2001: A Space Odyssey making sure that wardrobe was as integral a piece of the puzzle as the effects, and Chitty Chitty Bang Bang throwing as much colour and razzle dazzle at the screen as possible. My controversial winner though has to be the most iconic of the bunch, with Jacques Fonteray and Paco Rabanne’s Barbarella sexing up the decade like no other movie. Which movie of 1968 do you think deserves the 1968 Best Costume Oscar? Let us know in the comments! Official Nominations: Camelot. Bonnie And Clyde. The Happiest Millionaire. The Taming Of The Shrew. Thoroughly Modern Millie. It’s difficult to argue with the official winner this year, Camelot brimming with colour and flair. My Nominations: One Million Years BC. You Only Live Twice. Camelot. Belle De Jour. Le Samourai. Indeed, Camelot is the only official nominee which survives the cull and makes it over to my nominations. One Million Years BC, Le Samourai, and Belle De Jour both contain iconic costumes, while You Only Live Twice is one of the few Bond films which seems to show a genuine appreciation for wholesale costume. Which film of 1967 do you think has the Best Costume Design? Let us know in the comments! Official Nominations: BW: Who’s Afraid Of Virginia Woolf? The Gospel According To Matthew. Mr Buddwing. Mandragola. Morgan! Colour: A Man For All Seasons. Gambit. Hawaii. Juliet Of The Spirits. The Oscar. My Winner: BW: The Gospel According To Matthew. Colour: A Man For All Seasons. My Nominations: The Gospel According To Matthew. A Man For All Seasons. Hawaii. The Bible. Blowup. Prince Of Darkness. Farenheit 451. The Good, The Bad, And The Ugly. The Wild Angels. My Winner: A Man For All Seasons. Which film do you think had the Best Costume Design of 1966? Let us know in the comments! Official Nominations: BW: Darling. Morituri. A Rage To Live. Ship Of Fools. The Slender Thread. Colour: Doctor Zhivago. The Agony And The Ecstasy. The Greatest Story Ever Told. Inside Daisy Clover. The Sound Of Music. Actual Nominations: As with Cinematography the category was split into BW and color and featured a cross-section of epics and musicals, featuring many of the same films as were nominated for Cinematography. The official winner for BW was Night Of The Iguana but there really isn’t a lot to pick between this and the other nominees- Hush Hush, A House Is Not A Home, Kisses For My President, The Visit. Again the colour nominations are more interesting, with Harry Stradling picking up the win for My Fair Lady. Completing the nominations are Becket, Mary Poppins, Molly Brown, and What A Way To Go. Edith Head’s designs were nominated in both colour and BW, but she did not pick up a win this year. My Winner: BW: Night Of The Iguana. Colour: Mary Poppins. Few films of the decade had such vibrancy in all areas as Mary Poppins, so it gets my vote over My Fair Lady. My Nominations: My Fair Lady. Mary Poppins. Band Of Outsiders. A Fistful Of Dollars. The Fall Of The Roman Empire. Zulu. I’ve added 4 films to the 2 carried over from the official nominations, and only 1 of the 6 is BW. Band Of Outsiders has that timeless cool French Chic thanks largely to Christiane Fageol’s work which is in stark contrast to my other picks. A Fistful Of Dollars is as you would expect, all dirty, beaten ponchos, but it was films like this which started the endearing look and people like Carlo Simi and Maria Casado who perfected it. My final picks are historical epics, a genre which relies heavily on Costume Design to convey authenticity and tone. It may seem easy to pick a popular outfit of the time and put actors in it, but it takes an unprecedented amount of time, detail, and dedication to get everything just right. Arthur Newman may not have had a large career in Wardrobe, but each feature he worked on has that memorable touch. In Zulu he oversees the costumes of our band of under siege soldiers but also the tribal garments of the marauding warriors. However, my win goes to the joint venture between Veniero Colasanti and John Moore (who also provided the Set Design) whose experience of working together on other hits such as El Cid pays off for the lost epic The Fall Of The Roman Empire. Their designs range from outfits for soldiers of all levels to pure tunics for senators to luxurious dresses for Sophia Loren. My Winner: The Fall Of The Roman Empire. Let us know your picks for the best Costume Design of 1964!